The Problem: the charted shoal west of flashing daybeacon #8 has been building farther to the south and east. The markers have been moved accordingly. Some non-updated electronic charts will take you too far west as you approach the gap between #7 and #8. More recently, the latest edition of chart 11553 shows the infamous magenta line passing west of newly installed marker #8A. 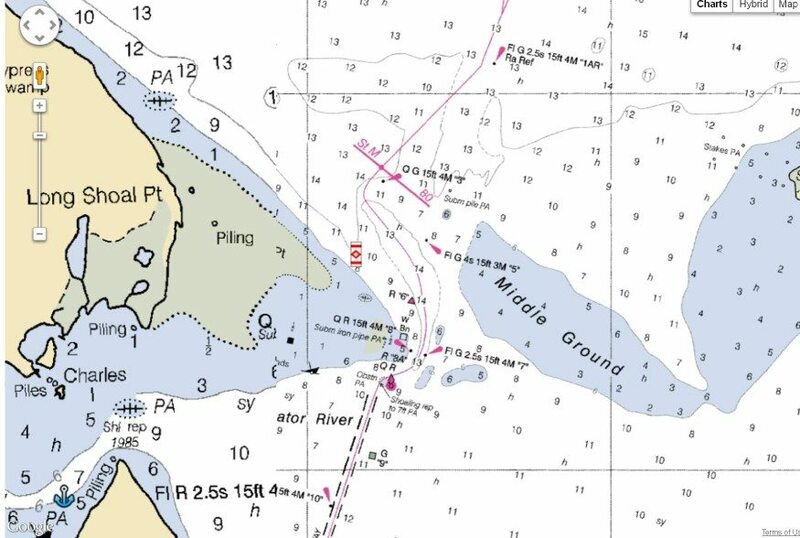 DO NOT follow the magenta line, through this stretch, as is often the case along the AICW.The Solution: BE SURE TO PASS MARKER #8A TO ITS EASTERLY SIDE, AND IGNORE THE PLACEMENT OF THE MAGENTA LINE ON CHART 11553, WHICH SHOWS THE LINE PASSING WEST OF THIS AID TO NAVIGATION. Do NOT blindly follow your chartplotter. WATCH FOR NEW, UNCHARTED AIDS TO NAVIGATION AND CAREFULLY STAY TO THE CORRECT SIDE OF ANY SUCH MARKERS YOU SPOT, BASED ON THEIR COLOR!